Guests have asked us for a trip to South Africa for over a decade. We believe we've finally put together the perfect bike tour of this interesting country. We've included a safari in Addo Elephant Park, a visit to the ostrich feather capital of the world, and an ending in Cape Town, considered to be one of the most beautiful and vibrant cities in the world. 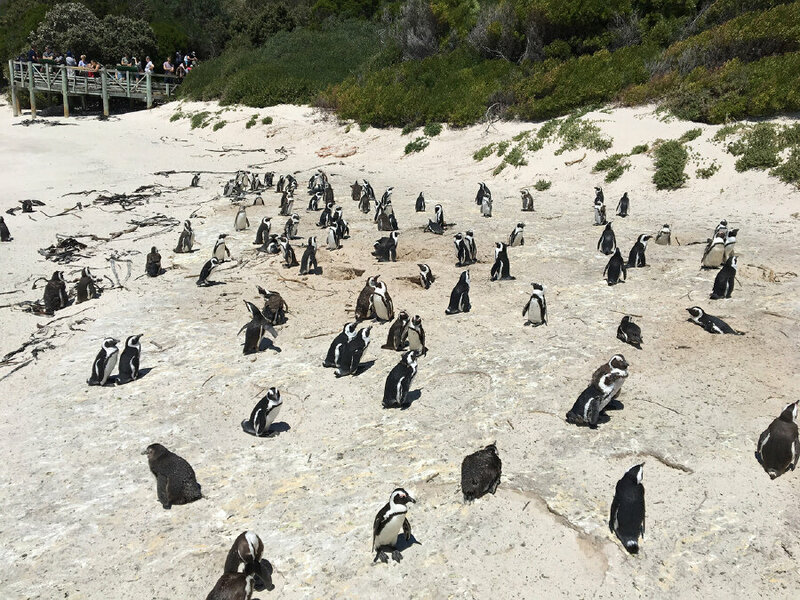 In between, we'll cycle along the Indian Ocean, through Tsitsikamma National Park and by an African penguin colony. Join us! Rolling hills with a couple longer climbs and some flat sections. Moderate cycling level. Leisurely cycling level with an electric-assist bike. The shorter daily miles will leave us time to explore the sites along the way. About 20% of the routes are on unpaved roads. 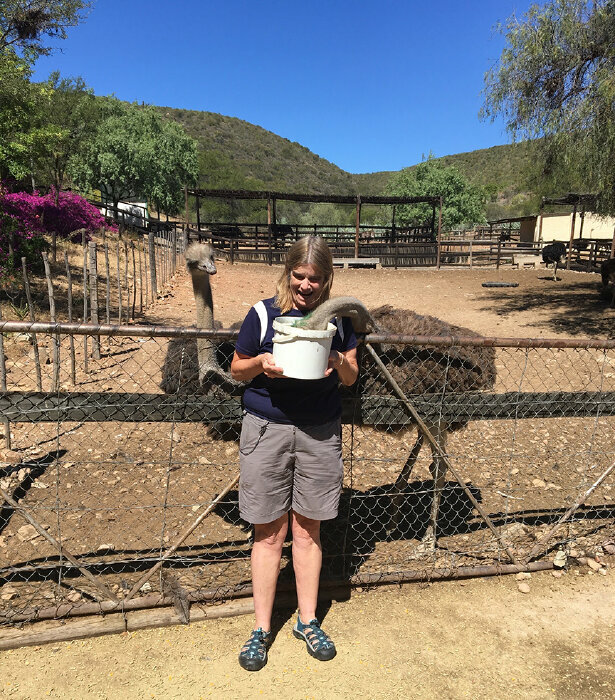 11 nights lodging, 11 breakfasts, 10 lunches, 10 dinners, snacks, van support, entrance fees to national parks, elephant safari, cave tour, ostrich farm tour, rental bicycle, airport transfers, and trained guides. Hybrid bike is included in the cost of the tour. Electric-assist bike is available for $195. Fly into Port Elizabeth, South Africa (PLZ) by 2:00pm and out of Cape Town, South Africa (CPT) after 1:00pm. We will transfer you to and from the airport on the first and last days of the tour. 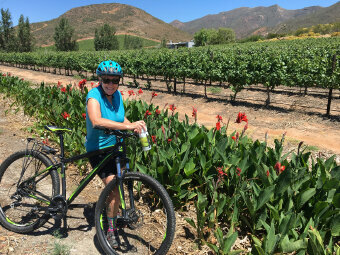 "It was more than a bike tour; it was a fabulous two week long adventure. So many fun choices - biking, safari, hikes, bird watching, an up-close visit with ostriches, watching both the Indian and Atlantic Oceans and their beaches, traveling through a constantly changing landscape, farms, villages, cities, desert, mountains, pastures, race horses, penguins, baboons, caves, etc., and of course beautiful gardens showcasing South Africa's famous protea flowers. Hard to believe we experienced all this in just two weeks!" 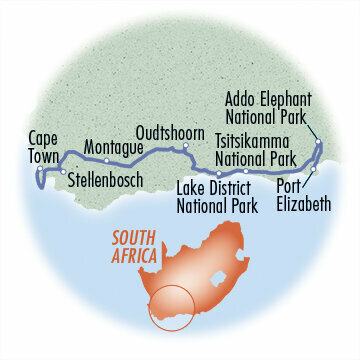 DAY 1: We’ll meet at 2:00pm and shuttle to our lodging near Addo Elephant National Park. We’ll relax in the afternoon and then enjoy our first dinner together. 0 miles. DAY 2: In the morning, we’ll take a photo safari through the national park to catch sight of some of the 600 elephants that live there. They share the sanctuary with the other members of the African Big Five: lions, rhinos, buffaloes and leopards. If we’re lucky, we may even see zebras, antelopes, warthogs and lots of wonderful birds. Then we’ll return to Port Elizabeth and start our cycling along the Garden Route. This stretch of land along the southern coast of South Africa is known for its lush and diverse vegetation, as well as its numerous lakes and lagoons. We’ll cycle on a quiet road where we may even see baboons cross our path. We’ll pass the famous Paul Sauer Bridge over the Storms River and then enter Tsitsikamma National Park. 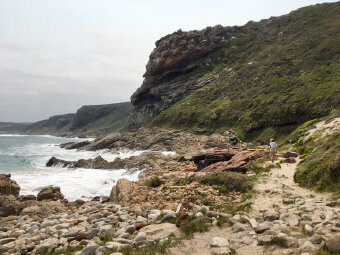 Then we’ll hop off our bikes for a hike through the lush forest to the mouth of the Storms River. The views are gorgeous as you walk across the beautiful gorge on the suspension bridge low over the river. 28 miles cycling and 1-hour hike. DAY 3: We have another beautiful day of cycling as we make our way through the deep valley of the Bloukrans River. We’ll stop for a swim or walk along the beach before lunch. 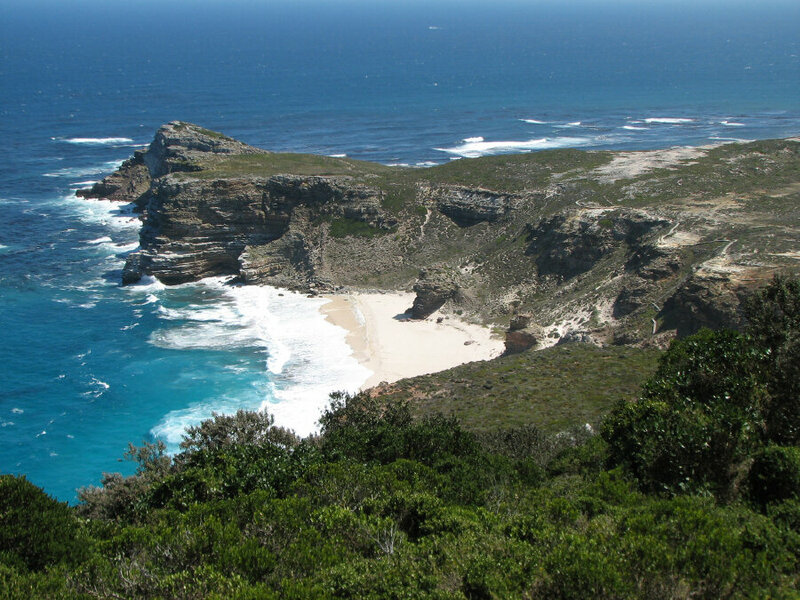 Then we’ll hike around the Robberg Nature Reserve, a peninsula that juts out into the sea, and watch as waves crash against its dramatic shoreline. We’ll overnight in the lovely city of Knysna. 22 miles cycling and 2-hour hike. DAY 4: We’ll continue our ride west along the Garden Route as we cycle below dense canopies of trees. We’re quickly into the Lake District that is a haven for a multitude of birds. We’ll stay overnight in a guesthouse minutes from a beautiful beach. 37 miles. DAY 5: After breakfast, we will shuttle over Outeniqua Pass and enter the semi-desert region of Little Karoo. You’ll be amazed by the change in terrain. 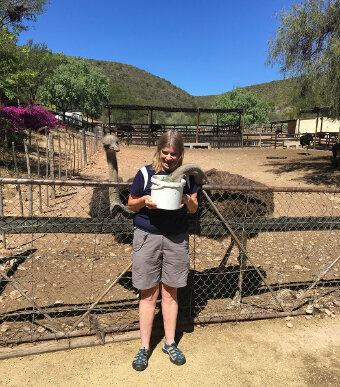 We’ll cycle through shrubs and grasses to our lunch on an ostrich farm before we end our ride in the ostrich capital of the world – Oudtshoorn. The birds have been raised for their feathers here since the 1860s. You can unpack your bags because we’re here for the next two nights. 28 miles. 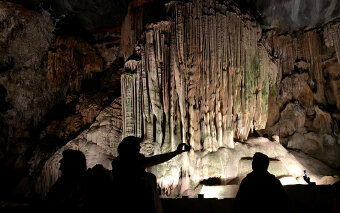 DAY 6: After a wonderful breakfast, we’ll cycle through the Schoemans Poort gorge to the Cango Caves. It’s surprising to tour these red, orange and pink stalagmite-filled caves hidden below the earth’s surface. You can spend the afternoon visiting the town of Oudtshoorn or by relaxing at the pool. Dinner is on your own tonight. 20 miles. DAY 7: After a morning shuttle through Little Karoo, we’ll ride our bikes toward the charming town of Montagu nestled in the surrounding hills. After lunch, we’ll hike the Lover’s Walk to get a close-up view of the beautiful gorge and cliff walls. 28 miles cycling and 1-hour hike. 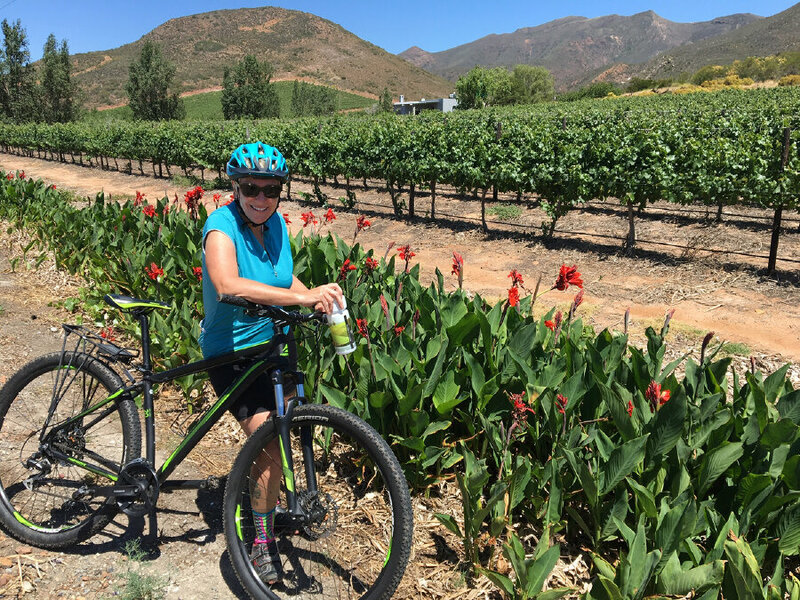 DAY 8: We leave Montagu by cycling through the narrow Cogmannskloop gorge and then we head into wine country. The Breede River Valley is surrounded by mountains and is responsible for much of South Africa’s production of chardonnay, cabernet sauvignon and shiraz. We’ll end the day with a short shuttle to our lodging in the historic town of Stellenbosch. It was founded in the 1600s by a Dutchman and is home today to a major university and many wineries. 37 miles. DAY 9: We’ll head out after breakfast by cycling to the Jonkershoek Nature Reserve. 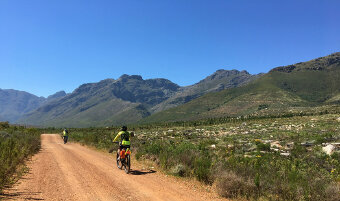 The jagged Jonkershoek Mountains serve as our backdrop as we ride through the valley. 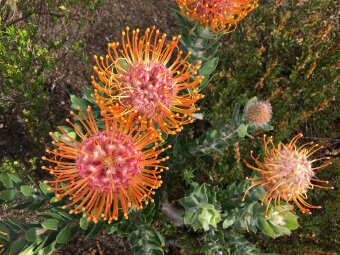 Keep your eyes peeled for the Protea, or Sugarbushes. Their beautiful flowers have come to represent change and hope. We’ll finish our day with a shuttle into Cape Town and a guided walking tour of this beautiful and bustling city. 25 miles and 1.5-hour walk. DAY 10: We take a day off from bicycling to explore more of our surroundings. We’ll walk through gorgeous Kirstenbosch Botanical Gardens and then hike up a shady ravine to the most famous landmark in the city – Table Mountain. From this National Park, you’ll be able to see where the Indian Ocean meets the Atlantic Ocean. We’ll return to our hotel via cable car. 0 miles cycling and 4-hour hike. DAY 11: Our last day of cycling will take us to the Cape of Good Hope Nature Reserve. 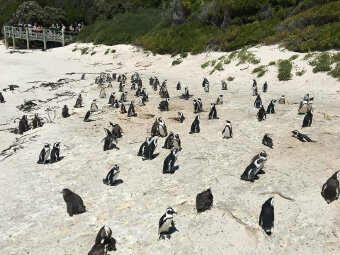 Along the way, we’ll visit the African Penguin colony at Boulders Beach. They are one of 17 different species of penguin and the only one on the continent. As anyone who has seen penguins can attest, it is hard to tire of watching these amusing creatures! Then we’ll cycle on to a lighthouse above Cape Point for a spectacular view of the wild coast. 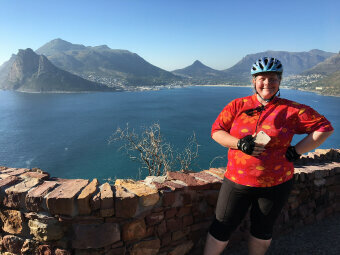 We’ll end our cycling on the famous Chapman’s Peak Drive, as we hug the coast on the side of the mountains. We’ll head down to the water and the fishing village of Hout Bay and then return to Cape Town for our final dinner together. 39 miles. DAY 12: After our last breakfast together, we’ll visit the township of Khayelitsha. In South Africa, “township” refers to the usually underdeveloped urban living areas inhabited by non-white people. We’ll visit a kindergarten and learn about life in a township. Then we’ll say our good-byes and head to the airport, arriving by 12:00 noon. 0 miles.